Going for a long walk can be compared to a journey. A hike of a day or more is a journey in its elementary form. The walker goes from one resting place to another, amid changing scenery and, in a direct way, loses himself in the landscape. The walker isn’t introspective, he is out to get to know the world. Philosopher Ton Lemaire, wrote that the first real walkers of western society were the romantics. They were the travellers of immeasurable landscapes. At the end of the eighteenth century the romantic saw himself in juxtaposition to the vastness of nature and felt insignificant in the big world. This walker wanted to experience nature intensely and used the course of the walk to think about himself and the world. While walking, thoughts flowed. The contemplative walks of Jean-Jacques Rousseau as described in his “Reflections of a lonely walker” (1782) are examples of this. Characteristic of the romantic feeling is a longing for the abrogation of the deeply felt opposition of the individual to nature, the longing for a connection between the self and the world. The walk through the countryside assisted in this attempt at integration. The journey is a motif that frequently occurs in the thinking and culture of western society. The walk and the journey are metaphors for the person who is trying to find himself. Whoever seeks and wants to think, is like a traveller setting out. He goes out into the world to get to know it and thereby to get to know himself. As he travels the surroundings change and the traveller himself changes towards and with the landscape. “Schlecht wandern, dass heisst, als Mensch dabei unverändert bleiben. Ein solcher eben wechselt nur die Gegend, nicht auch sich selber an und mit ihr”. With these words the German philosopher Ernst Bloch summed up the motive for travelling. Apart from personal development a journey is likewise the symbolic representation of the course of world history. For the world changes as well because the individual has passed through it. History and civilisation are shaped by the continuous mutual interpenetration of the individual and the world; of the subjective and the objective. This too will lead to rapprochement : the world no longer remains strange to the traveller and the traveller is eventually no longer a stranger to the world. Travelling and walking are important aspects of the art of Frans van Lent. In search of new ideas he travelled a number of times to the Greek islands and the Canaries. In recent years he made his long walks. Loop (2000) was a journey of three weeks along the Pieterpad. Pulse (2002) was a seven day hike through a volcanic crater on the island of Tenerife. Pas (2003) was a one day hike from sunrise to sunset and Path (2003) was a walk of twelve days through the North of England. In an explanatory note about his first walk Van Lent wrote “The idea for the walk arose from the need to concentrate. Not, as in earlier journeys, with the intention of making plans for future work, but to focus my mind to thoughts, ideas and reflections which occurred to me there and then.” Just the same this concentration on the here and now – which is reflected in photographs, films, sounds and written meditations that he publishes directly onto the Internet – does not prevent Van Lent from encountering the universal themes of the walk. During the walk Van Lent experiences the problematic relationship of the individual with reality. Illustrative of his awareness of this is a sketch in his diary dated 27 April 2003. He has drawn a walking figure with a rucksack. The head of the figure is in the clouds and his feet are on the ground. Van Lent has written “Headpath” and “Footpath” beside this little drawing in order to indicate the difference he senses between the simple motor movement of walking and the internal flow of thought. This relationship emerges again and again in various forms in his account of his travels. Just as he feels the physical automatism of walking becoming free from the stream of thought, he is at the same time conscious of the separation of the person who observes and the concrete material qualities of nature. In Pulse he has made photographic recordings of the volcanic landscape in which his own presence dominates. Not only does he photograph the rocky formations, but he also shows stones as he holds them himself. There is a photograph of a stone that he has put on his head. Van Lent has made a film of the mist drifting past him as he stands in the landscape. He has photographed the ground but more importantly his own shadow falling on the ground. He has filmed the earth as he walks and you hear his footsteps and breathing. You see the air and the mountains in the distance with a part of his head in the foreground. “Much of the work here can be described as an attempt to make myself a part of the landscape,” Van Lent notes in his diary. Is my head a thing like that stone lying on top of it, he seems to be wondering. Is my shadow a part of me or a part of the landscape? In Path Van Lent’s presence is less dominant. He disappears into the views and panoramas that he has recorded. In this walk he is primarily concerned with the subtle play of observation and reality. Inspired by the history of the landscape in which he follows the route of Hadrian’s wall, built by the Romans straight through Northern England, he is on the look out for traces, signs and structures in the land. What is a footpath, he wonders. “You look for some form of organised design in the chaos. Shadows lying within one another’s length, clumps of grass trampled down in the same direction. (…) You interpret the image from your own preconceptions and you walk on, convinced you are right yet you are actually completely wrong.” The path is a notional yet at times a real line that is continually interrupted. “The wall too is continually interrupted line. The difference is that the essence of this line is not dependent on the interpretation of the walker, but has been an undoubted physical reality for thousands of years,” he writes. All the time there is this observation of reality and the interpretation by the walker of the patterns and structures therein. The walks are to be regarded as independent works of art. At the same time they led to a series of works that are derived from them and related to them. 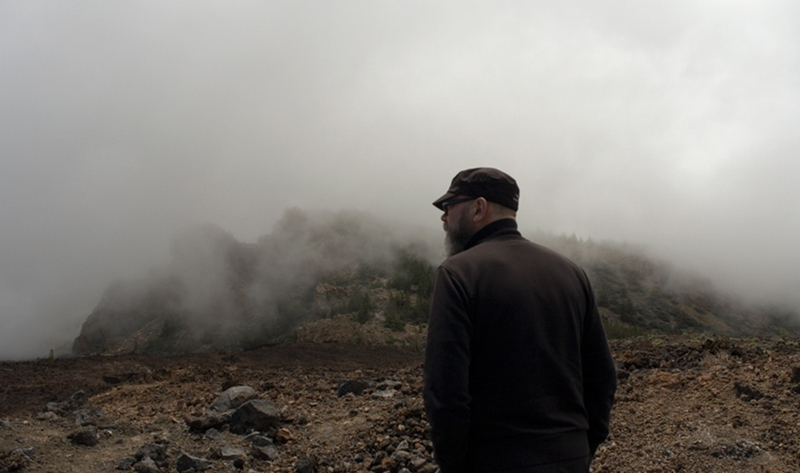 Staan (2002) for example, is a video projection in which Van Lent stands in a volcanic landscape while the mist drifts past him. Pictura (2002) is an installation in which two feet are projected onto a sand relief modelled in the form of the feet. Walk (2002) is a variation of this, with a descending foot that comes down right onto a sand relief. In these works the themes around walking remain in force. Van Lent plays a game with observation and reality through which the viewer feels the distance between what he thinks he sees and what is really there. Does the foot really leave a print in the heap of sand? Van Lent deliberately builds in a turning point between reality and illusion through which the image of the foot disappears as soon as anyone enters the darkened projection room. In his most recent work Muur (2004) the walking themes come together again. Muur is a video with alternating stills and moving images. During the moving images you can hear the thunderous roar of the wind. The imposing wall begins to shake because Van Lent, impeded by the wind, could not hold the camera still during the recording. Because of this shaking image the wall suddenly loses its forbidding presence, its objective character of heavy physical reality, and becomes an unstable structure dependent on subjective observation. Reality and observation, object and subject are alternately driven apart and then brought together again. Muur includes the whole project of the walks in a concentrated form. Een lange wandeling maken door een landelijk gebied kun je vergelijken met een reis. Een voettocht van een dag of meer is een reis in zijn elementaire vorm. De wandelaar loopt van rustpunt naar rustpunt, wisselt van omgeving en ondergaat het landschap op een directe manier. De wandelaar blijft niet bij zichzelf, hij trekt er op uit om de wereld te leren kennen. De eerste echte wandelaars van het westen waren de romantici, schreef de filosoof Ton Lemaire. Het waren de reizigers van het onmetelijke landschap. Tegen het einde van de achttiende eeuw zag de romanticus zich geplaatst tegenover de overweldigende natuur en voelde zich nietig in de grote wereld. Deze wandelaar wilde de natuur intens ondergaan en benutte het verloop van de wandeling om na te denken over zichzelf en de wereld. Al wandelend komen de gedachten. De contemplatieve wandelingen van Jean-Jacques Rousseau, opgetekend in zijn Overpeinzingen van een eenzame wandelaar (1782) zijn daarvoor exemplarisch. Karakteristiek voor het romantische gevoel is het verlangen naar het opheffen van de diep gevoelde tegenoverstelling van de eenling en de natuur, het verlangen naar een verbinding van het ik en de wereld. De wandeling door het landschap bemiddelt in deze poging tot eenwording. De reis is een veelvoorkomend motief in het denken en de cultuur van westen. De wandeling en de reis zijn metaforen voor de mens die zichzelf probeert te vinden. Wie zoekende is en denken wil, is als een reiziger die er op uit trekt. De reiziger trekt door de wereld om die te leren kennen, en door haar zichzelf te leren kennen. Op reis verandert de omgeving, maar ook de reiziger zelf verandert aan en met die omgeving. ´Schlecht wandern, dass heisst, als Mensch dabei unverändert bleiben. Ein solcher eben wechselt nur die Gegend, nicht auch sich selber an und mit ihr’, zo vatte de Duitse filosoof Ernst Bloch het reismotief samen. Behalve voor de persoonlijke ontwikkeling is de reis eveneens de symbolische voorstelling van het verloop van de wereldgeschiedenis. Want ook de wereld verandert omdat deze door het individu wordt doortrokken. Geschiedenis en beschaving worden gevormd door de voortdurende wederzijdse doordringing van het individu en de wereld, van het subjectieve en het objectieve. Ook dit zal leiden tot een toenadering: de wereld blijft voor de reiziger niet vreemd en de reiziger is uiteindelijk geen vreemde meer voor de wereld. Reizen en wandelen zijn belangrijke bestanddelen van het kunstenaarschap van Frans van Lent. Om tot nieuwe werken te komen reisde hij verscheidene keren naar de Griekse eilanden en naar de Canarische archipel. De laatste jaren maakt hij lange wandelingen. Loop (2000) was een tocht van drie weken over het Pieterspad. Pulse (2002) was een zevendaagse voettocht door een vulkanische krater op het eiland Tenerife. Pas (2003) was een eendaagse voettocht van zonsopgang tot zonsondergang en Path (2003) was een wandeling van twaalf dagen door het noorden van Engeland. In een toelichting op zijn eerste wandeling schreef Van Lent: ‘Het idee van de wandeling is ontstaan vanuit de behoefte aan concentratie. Niet met de bedoeling om, als in vorige reizen, ontwerpen te maken voor komende werken, maar om me vooral te richten op gedachten, ideeën en overwegingen die mij ter plaatse bezighouden’. Toch kan deze concentratie op het hier en nu, die zijn neerslag krijgt in foto’s, filmpjes, geluiden en geschreven overpeinzingen die hij direct op het internet publiceert, niet verhinderen dat Van Lent op de universele thema’s van de wandeling stuit. Tijdens het wandelen ondervindt Van Lent de problematische verhouding van het individu tot de werkelijkheid. Illustratief voor zijn bewustzijn daarvan is een schetsje in zijn dagboek van 27 april 2003. Hij tekent een wandelende figuur met een rugzak. Het hoofd van de wandelaar is in de wolken en zijn voeten op de grond. ‘Hoofdpad’ en ‘voetpad’, schreef Van Lent bij dit tekeningetje, om daarmee het gevoelde verschil aan te geven tussen de ‘kale motoriek van het wandelen’ en de interne flux van het denken. Deze verhouding duikt in wisselende vorm steeds weer op in zijn reisverslagen. Zoals hij het fysieke automatisme van het lopen los voelt komen van de stroom van het denken, zo voelt hij ook steeds de scheiding van de persoon die waarneemt en de concrete, dingachtige hoedanigheid van de natuur. In Pulse maakt hij opnamen van het vulkanische landschap waarin zijn eigen aanwezigheid domineert. Hij fotografeert het rotsachtige gesteente, maar toont die stenen ook zoals hij ze vasthoudt. Er is een foto van een steen die hij op zijn hoofd heeft gelegd. Van Lent maakt een korte film van de mist die aan hem voorbij drijft terwijl hij in het landschap staat. Hij fotografeert de bodem, maar vooral zijn eigen schaduw die op de grond valt. Hij filmt de aarde terwijl hij loopt en je zijn voetstappen en adem hoort. Je ziet de lucht en de bergen in de verte met op de voorgrond een deel van zijn hoofd. ´Veel van het werk hier is tot nu toe te omschrijven als pogingen om mezelf onderdeel te laten zijn van het landschap´, noteert Van Lent in zijn dagboek. Is mijn hoofd een ding net als die steen die er op ligt, lijkt hij zich af te vragen. Is mijn schaduw een deel van mijzelf of een deel van het landschap? In Path is Van Lent minder overheersend aanwezig. Hij verdwijnt in de uitzichten en panorama’s die hij vastlegt. Wat hem in deze wandeling bezig houdt, is vooral het subtiele spel van waarneming en werkelijkheid. Geïnspireerd door de geschiedenis van het landschap waarin hij de route volgt van Hadrian’s Wall, de muur die door de Romeinen dwars door Noord-Engeland werd aangelegd, gaat zijn aandacht uit naar de sporen, tekens en structuren in het land. Wat is een voetpad, vraagt hij zich af. ‘Je zoekt in de chaos naar een vorm die in zekere zin georganiseerd is: schaduwen die in elkaars verlengde liggen, platgetrapte polletjes in een doorlopende richting. (…) Je interpreteert het beeld naar je verwachting en loopt overtuigd van je gelijk volkomen verkeerd’. Het pad is een denkbeeldig soms een werkelijke lijn, die steeds wordt onderbroken. ‘De muur is ook een lijn die voortdurend wordt onderbroken. Het verschil is dat de ‘zin’ van deze lijn niet afhangt van de interpretatie van de wandelaar, het is al duizenden jaren een loodzware fysieke werkelijkheid’, schrijft hij. Er is steeds die waarneming van de werkelijkheid en de interpretatie van de patronen en structuren daarvan door de wandelaar. De wandelingen zijn te beschouwen als zelfstandige kunstwerken. Toch hebben ze geleid tot een reeks van afgeleide en verwante werken. Staan (2002) bijvoorbeeld, is een video-projectie waarin Van Lent in een vulkanisch landschap staat en de mist, wolken en regen aan hem voorbij drijven. Pictura (2002) is een installatie waarin twee voeten worden geprojecteerd op een zandreliëf dat in de vorm van die voeten is gemodelleerd. Walk (2002) is een variant daarop, met een bewegende voet die bij het neerkomen precies op een zandreliëf valt. In deze werken blijven de thema´s van het wandelen actief. Van Lent speelt een spel met waarneming en werkelijkheid, waardoor de kijker de afstand voelt tussen wat hij denkt te zien en wat er werkelijk is. Laat de voet echt een afdruk achter in de berg van zand? Heel direct bouwt Van Lent een omslagpunt in van werkelijkheid en illusie, doordat het geprojecteerde beeld van de voeten verdwijnt zodra iemand de verdonkerde projectieruimte binnenkomt. In Muur (2004), zijn meest recente werk, komen de thema´s van het wandelen nog eens samen. Muur is een videoinstallatie met afwisselend een stilstaand en bewegende beelden van Hadrian’s Wall. Bij de bewegende beelden hoor je het geraas van de wind. De imposante muur gaat trillen omdat Van Lent bij de opname vanwege de wind zijn camera niet stil kon houden. Door dit trillen van het beeld verliest de muur opeens zijn ongenaakbare aanwezigheid, zijn objectieve karakter van ‘loodzware fysieke werkelijkheid’, en wordt een instabiel bouwsel afhankelijk van de subjectieve waarneming. Werkelijkheid en waarneming, object en subject worden in deze beelden afwisselend uiteen gedreven en weer tot elkaar gebracht. Muur bevat in een geconcentreerde vorm heel het project van de wandelingen. This entry was posted in Texts/Books on 09/04/2015 by Frans.